You can see a very nice looking Saturn using Google Earth thanks to an excellent 3D textured model by a Google Earth Community member. Download this Google Earth Saturn model here . You will need to be using Google Earth 4 Beta (if you haven't already downloaded it). You can spin the model and look at it from different angles. The Google Earth Saturn file was created by 'barnabu' and posted here. He used SketchUp and Paintshop Pro to create the rings and Blender for the globe texturing. Apparently Google Earh has some problems with rendering large 3D Models like this because you see some weird rendering artifacts in the rings at certain angles. But, overall the model looks really nice. I still think Google Earth should be extended to the rest of the universe like the nice open source program Celestia. 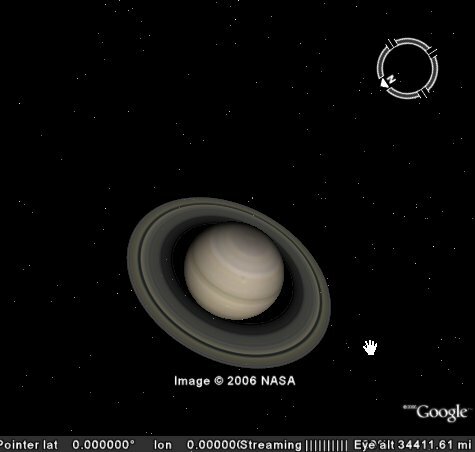 Ping Pong Ball Interface to Google Earth - Cool! Back in May a video was released showing some guys controlling Google Earth by using lighted ping pong balls in a darkened room. Those of you who saw the movie "Minority Report" might get an idea of the type of control this might give you. Or, you could just watch this video of the demonstration. The "Atlas Gloves" system uses a cheap web camera to pick up position of the balls. 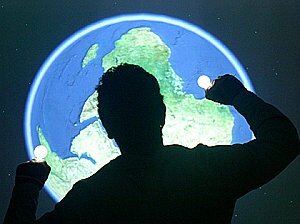 You simply gesture with the lighted ping pong balls to zoom in on aerial photos, to pan the Earth, or even tilt your views. This is a really neat concept in alternative interfaces to 3D worlds. Back in my NASA days, when I was doing research in Virtual Reality, we used data gloves, which cost about $5-10K, to interact with 3D content. This is actually a much less expensive way to do pretty much the same thing. The Atlas Gloves guys have instructions on making the lighted ping-pong balls for $8 in about 5-minutes. The software, which was just released, is open software. Seems inexpensive, and easy, enough for almost anyone to try out. So, look for a report from me soon on how well it works. Via OgleEarth. 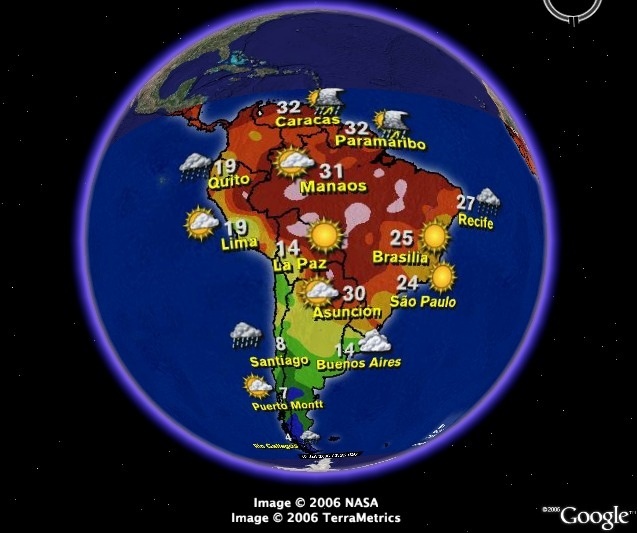 Geo Blog GeoRSS in Google Earth - this link will let you see the locations of stories from a number of Geo-related blogs based on automated processing of locations from their RSS feeds. In other words, the program looks for names of locations mentioned in stories and georeferences the blog entry. You can click on a placemark (if it figures out a location) to read the RSS feed of the blog entry. Includes Google Earth Blog, OgleEarth, Google Blog, and others. See the post by Valery35. Similar to NewsGlobe, but better. Discovery Channel Placemarks - The Discovery channel has added a few more placemarks covering more of the world with quality links to multimedia content. See original story. Richard Treves (who did some excellent online Google Earth tutorials earlier this year) is conducting a Google Earth workshop at Keele University (UK) from 4-7 September as part of the Society of Cartographers Summer School. Dr. Hudson-Smith, at his DigitalUrban blog, has published a video showing experimentation with placing real building models in the City Life 3D rendering engine. 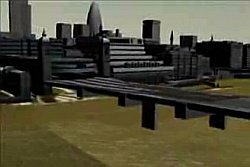 City Life is a game, it is not based on reality (no aerial photography), but it is a fun looking world to experience - and is now available to view for free. The video at Digital Urban is fun to watch - he points out that combining the interfaces of Google Earth, City Life, and Second Life would be a killer application. I agree! 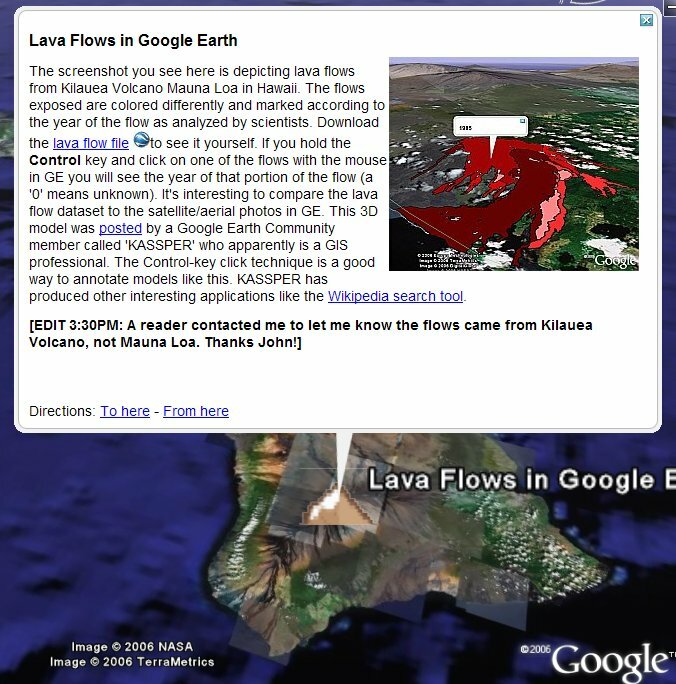 The screenshot you see here is depicting lava flows from Kilauea Volcano Mauna Loa in Hawaii. The flows exposed are colored differently and marked according to the year of the flow as analyzed by scientists. 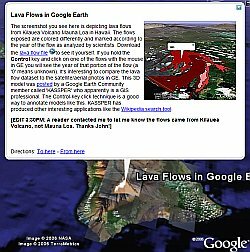 Download the lava flow file to see it yourself. If you hold the Control key and click on one of the flows with the mouse in GE you will see the year of that portion of the flow (a '0' means unknown). It's interesting to compare the lava flow dataset to the satellite/aerial photos in GE. 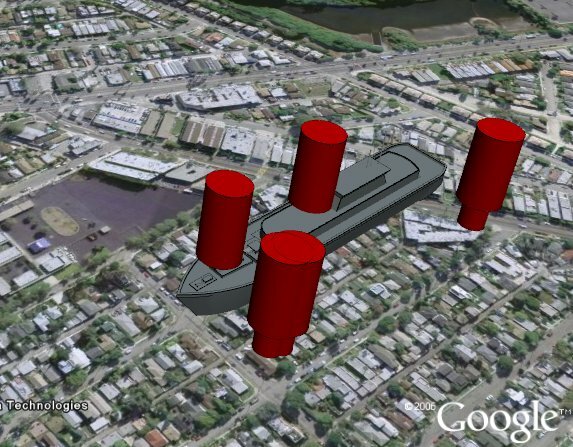 This 3D model was posted by a Google Earth Community member called 'KASSPER' who apparently is a GIS professional. The Control-key click technique is a good way to annotate models like this. KASSPER has produced other interesting applications like the Wikipedia search tool. 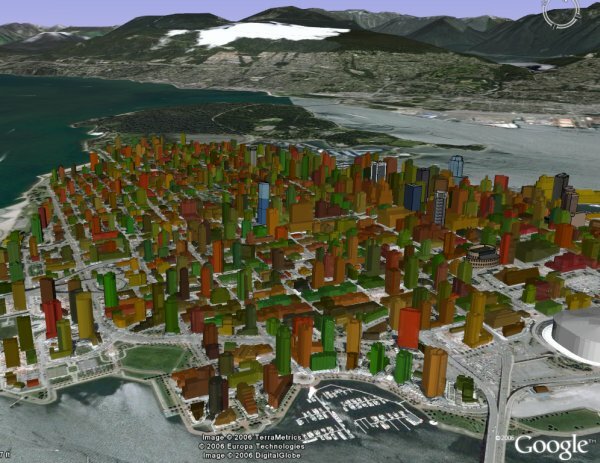 Stefan Lorimer writes at his blog about his experiences so far this week at GeoWeb 2006 (a conference being held at Vancouver, British Columbia which covers the convergence of web technologies, XML, and GIS). From Google were Michael Jones (CTO of Google Earth) who gave a keynote presentation, Michael Ashbridge gave a presentation on KML, Doug Ricket on Google Maps API, and apparently Bent Hagemark of the GE team also attended. My favorite comment was while Stefan was meeting with some of the Google Earth folks and "...working with the Google Maps API while Mr Jones and Mr Hagemark checked OgleEarth and Google Earth Blog loading the new content into GE". Stefan goes on to comment on some things he learned about Google Earth developers should look into: the new KML 2.1 has features enabling large datasets to be broken down and streamed more efficiently (like the feature mentioned in the ReefBase story here yesterday); and network links have new features improving their efficiency as well. The GE team encourages developers to read the KML 2.1 documentation for tips. Thanks for the input Stefan! Origins of Google Earth - Stefan Geens at OgleEarth adds another link to comments from one of the founders of Keyhole about the origins of the application which became Google Earth. 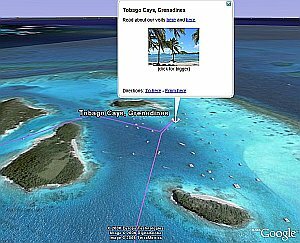 Transatlantic Sailing Records Compared - 'skyrover' at the Google Earth Community gathered data from three different sailing record passages across the Atlantic (1990, 2001, and 2006) and combined the data into Google Earth. The KMZ file lets you run a virtual race between the three boats - Playstation, OrangeII, and Jet Servcies). This is an innovative approach to showing sailing data, especially with GE 4. Developed by by the folks at Sailblogs.com. 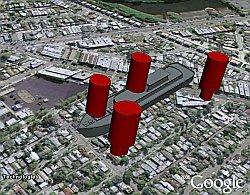 Realviz releases a new version of Stitcher which allows you to create panorama photos and now allows you to export to KML so you can georeference them. 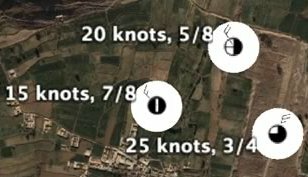 Nuclear plant in Kushab, Pakistan - Stefan puts together some satellite photos as overlays in Google Earth from a published report showing intelligence from satellite photos of this Pakistan nuclear plant. Read more here. Google is conducting another useability study for Google Earth and offering to pay you US$100 in American Express Gift checks if you are invited to spend 90 minutes in the study between August 1 and August 8 in the San Francisco Bay Area. This is similar to the study being conducted in Paris, France. Apparently the study takes 30 minutes less in the US so they are paying only US100 whereas they are getting 100 Euros (about US$126) in France. If you are interested in being considered for the San Francisco study go to this web page and follow the instructions to submit your name. Turn that hobby of looking at aerial/satellite photos into a profession! Coral reefs are some of the most endangered ecosystems in the world and, with climate change upon us, reefs are at great risk. Google Earth Blog previously wrote about the work by NOAA at the Coral Reef Watch web site. Recently I was contacted by a former intern of the ReefBase project which attempts to keep track of the status of reefs all around the world. 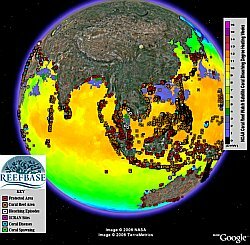 Keene Haywood has converted the ReefBase data into a Google Earth file so you can see some data about each of the hundreds of documented reefs (NOTE: Best viewed with Google Earth 4) This file is experimental and is not hosted by NOAA, but he hopes they will include it someday soon. Thanks to the big June update, many of the reefs areas now have high resolution satellite photos in GE. You can also download the current NOAA Coral Reef Watch GE file and turn on the "Sea Surface Temperature". Keene says: "I hope that this project gives people an idea of the breadth of reefs around the world and the threats facing them. If this project raises some awareness, then I will feel the project has had some impact." Important tip: By the way, Keene has used an interesting new feature in the KML 2.1 format which allows large collections of placemarks to be placed in "hidden" folders. This means when you click on a placemark in the folder it does not cause the folder to be opened in the Places pane. This is really important with large datasets. With GE 3 this file takes much longer to open and is more cumbersome to use. Those of you creating large collections of placemarks should look into this feature. Well, my backpacking trip plans were a little thrown off. We arrived at the trailhead for our chosen hike in Stone Mountain State Park, North Carolina only to find several rangers and search and rescue teams looking for a lost couple. The couple had left their Mercedes Benz (with Florida license plates) at the trail head on Friday supposedly to go on a picnic at a nearby waterfall. We offered to help with the search, but were told we had to be trained. My friend and I were also not allowed to go on our hike in the search area. Instead we camped at the Stone Mountain campground hoping they would find the couple overnight. The next day the couple were still not found, so we took a short hike around Wolf Rock and then drove up the Blue Ridge Parkway to look for a new hike. We ended up on a short hike in Doughton Park to a campsite a few miles to the south of Stone Mountain. This morning they found the missing couple at Devil's Garden Overlook on the Blue Ridge Parkway - over 2200 feet above where they left their car and after three days and nights without substantial food (there was plenty of water in the mountain streams). We had a Garmin 60Cx GPS running while we were moving around. 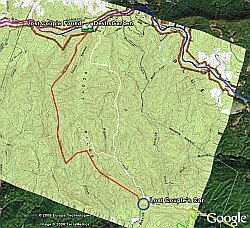 You can see our GPS tracks , overlayed on the satellite photos of GE, as we drove around the area as well as where we were hiking. 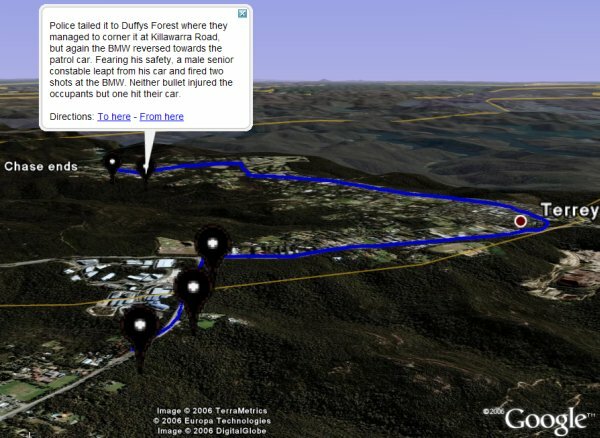 Also shown is the location of the missing couple's car and where they were found. The colors represent altitude as shown in the Elevation legend. Also included is a topographical map of the area where the missible couple were located. 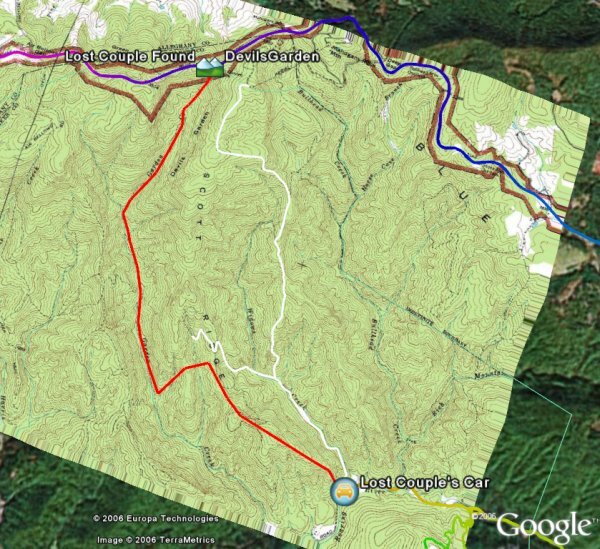 The red path is my theory about the possible route the missing couple took to get to the top. Here is the Charlotte Observer story about the lost couple. Will be gone backpacking for the next couple of days. So, if any news comes out, I may not report until Monday evening. NOAA expands radar data for Google Earth - the National Weather Service RIDGE radar images overlayed over the satellite photos in GE are available in a number of different sizes and composites at this experimental NOAA site. US locations only. "How far can Hezbollah Reach" - A image created in photoshop using GE as a mapping tool was done by Kathryn Cramer last week. She got an amazing amount of press for the image. Follow a Greenpeace Ship in the Bering Sea - the ship is taking note of the impact of overfishing and using GE to track and provide blog entries. This is a well done use of GE. Posted at the new Environment forum at the GEC. Using Picasa/GE to Geotag Photos - This tutorial from Digital Geography shows you how to use the new feature in the Picasa 2 beta to geotag photos quickly and easily using Google Earth. LocalWeekender.com - an online guidebook of outdoor spots and weekend trips. This website lets you post placemarks, pictures and descriptions of your favorite outdoor places and start a thread of discussion. 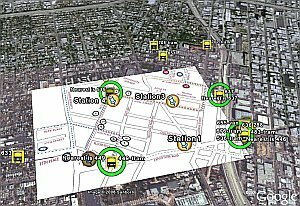 You use GE to create the placemarks, but a normal image map to find the locations. In an excellent use of Google Earth, someone living near the scene of action has begun documenting where military actions have occurred on both sides of the Israel-Lebanon conflict. This shows how GE's ability to tie information to location can be a powerful tool for visualization. This collection of placemarks shows the locations of the military actions based on news reports. Each placemark contains details on the action which occurred at the location and the casualties or damage resulting, and allows you to view the aerial photos and see what it looked like before the conflict. Turn on the "Borders" layer to get a clear understanding of the locations. The creator of the collection posted it at his web site here and notes that this is an "very incomplete" picture of the action so far. And yet, it still gives a much clearer picture of the quantity, scope and scale than any typical news report. If you want to keep up with whether the author of the collection updates the file, you can try putting this network link in your "My Places" folder and it will automatically reload the file when you check it. via OgleEarth. This is one of the most interesting finds in Google Earth in quite some time. 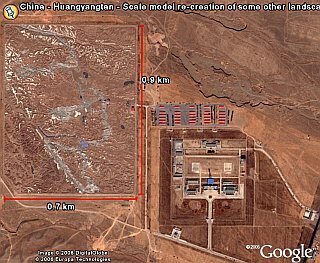 A few weeks ago a first time poster, called KenGrok, at the Google Earth Community (GEC) discovered a very exact scale model of some mountainous region located in the middle of a desolate area in north central China. 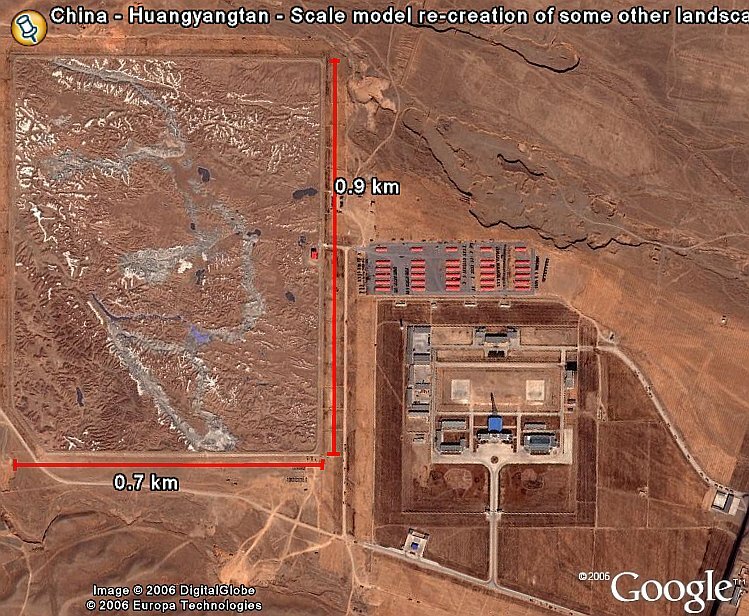 Seen in Google Earth the huge scale model is .9 km tall by .7 km wide. It is adjacent to what looks like a military base with many camouflaged vehicles. Last week, the same poster found the location the scale model represents - a region occupied by China but claimed by India near north central India. If you turn on the "Borders" layer in GE you will see they are colored red to indicate the dispute. Another GEC member showed how exact the scale model is by taking a screen shot of the satellite photo of the scale model and overlaying it over the real terrain (turn the image overlay on and off to see how exact it is). This scale model was most likely created for military reasons. Someone posted a description of why a military terrain visualization is critical for military purposes. You can also find other examples of military terrain models - see this Urban Warfare Training Center for the US Army. One person places their ships using Google Earth and the other person goes out in the normal world with a mobile phone, a GPS connected to the mobile phone. The phone has a small Python script on it that reads the GPS and sends the data to the game engine, which then updates the Google Earth KML model showing the current state of the game grid. When the player who's trying to sink the ships wants to try for a hit, they call into the game engine and say "drop". The game reads back the coordinates at which the "peg" was dropped and shortly thereafter, the other player will see the peg appear at the coordinate it was dropped. If the peg hits one of the ships, it's a Hit, otherwise it's a miss. You can check out a sample GE Battleship network link (NOTE: Works only with GE 4 Beta) which lets you see a battleship overlayed over the aerial photos in GE and watch the pegs being placed (assuming someone is testing the experiment). I think this is a great concept, and I can think of many other possible games using mobile applications and Google Earth. For example, how about virtual scavenger hunts? Or, virtual GeoCaches? Amazing! 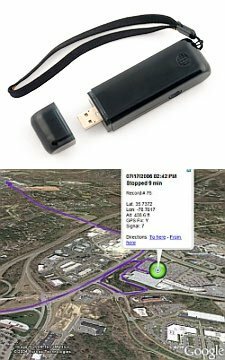 Trackstick is a GPS on a USB stick designed for unobstrusive tracking. The small non-descript unit comes with direct support for Google Earth (Windows only). It has no display, it just quietly tracks where it has gone. The idea is you could put this in a car, or something you want to track, and later download its track by simply sticking it in the USB port. I'm glad to say, the makers of Trackstick recently sent me a Trackstick to review and it not only operates well as a GPS, but its Google Earth interface works smoothly. I ran some tests by driving around the Raleigh area. 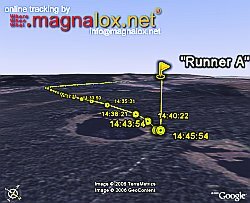 I also had a Garmin 60Cx with me to compare the tracks. The Trackstick defaults to a slow update rate (once per minute) which didn't leave a detailed track, but you can use the software to change the setting to update once per second. With the latter setting, the Trackstick was quite close to the Garmin for broadscale applications like driving. 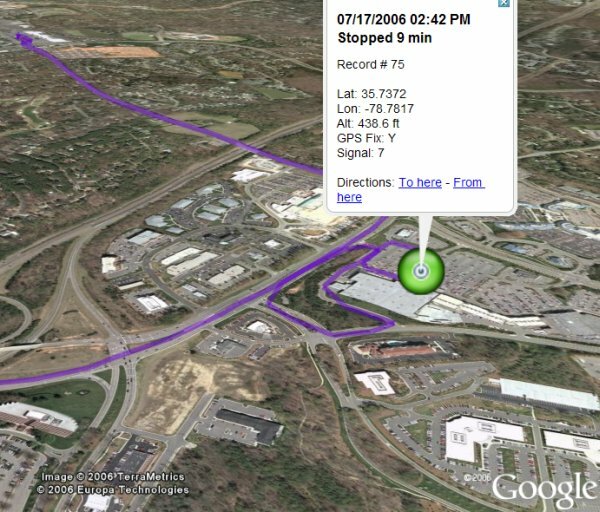 In this example Google Earth file , I drove between three shopping plazas in Cary, North Carolina. If you select "Path" in the Places pane and "Tools->Play Tour" you can follow the track. The folder has information on the speed of travel, direction, and the amount of time stopped at each location. The Trackstick's Google Earth support is done well. The download program allows you to filter the recorded results and just display the portions of the track of interest. The unit is about one fourth the size of my Garmin handheld. One possible use would be to keep an eye on where your teenage kids have been taking the car. The unit is available from distributors for a retail price of $250. The Trackstick is a small non-descript plastic case. You pop off one end to expose the USB stick. The current version requires a small screwdriver to open the battery case, a new version will have a snap-open case. It uses two AAA batteries. A small recessed button is used to set the modes or turn the unit on/off. A embossed logo is used to show the user which way to face the Trackstick as it must face "up" to see the satellites and get a signal. Since the Trackstick is so small, the antenna has limited receptivity compared to the more expensive Garmin 60Cx. It needs a clear view of the skies to record accurately, so placement is important. I don't believe the unit is water proof, although it is an enclosed plastic container and I imagine it is at least water resistant. But, a protected location would be best. Putting a sticky velcro attachment might be best if its to be placed on a car dash, otherwise it would slide around. After you get the unit, it is recommended to get the latest software off the web site. The new Fast Track mode is set by using the software's "Device Properties". It allows you to adjust the speed of recorded track points, and download the tracks after they have been recorded. 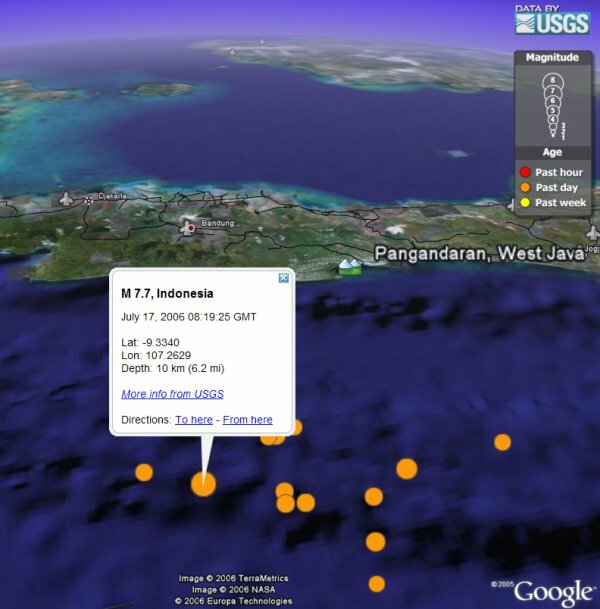 You can filter according to day and time and view in a number of mapping programs or Google Earth. You can also output to a CSV spreadhseet file. 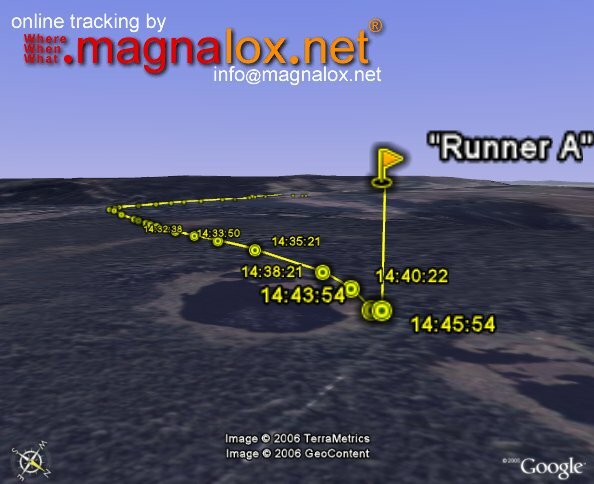 For Google Earth, not only are all the points marked with placemarks and information on speed, heading, location, and altitude; but also they provide a "Path" which allows you to smoothly follow the track in Google Earth. Conclusion: You can find lower cost GPS units which could also leave a track (for example, Garmin Forerunner <$100), but they won't be in such an unobtrusive package. Garmin units already come with software to support Google Earth, but the output doesn't directly contain the same details. The Trackstick company looks to be improving the product, and they are advertising a new product called the Trackstick Pro on their web site. I think the Trackstick has a niche market, and I like the Google Earth support. 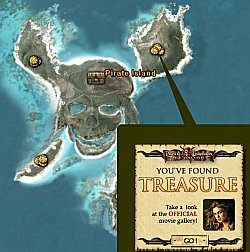 Disney has a promotional web site for "Pirates of the Caribbean - Dead Man's Chest" which uses Google Earth. The Google Earth file does very little but put up a custom photoshopped map of fictional islands from the movie and link you back to their web site for sound clips, movie clips, and pictures. The islands look just like normal aerial photos in Google Earth. However, they put the map in the Bahamas, not the heart of the Caribbean. But, its still fun. via OgleEarth. Another Tour de France live tracker is available called RouteFocus Live. This one only works if you have the latest GE 4 BETA and Windows. It requires you to install an application which runs in a separate window. I prefer the network link approach which works on all platforms and doesn't require installing an application. 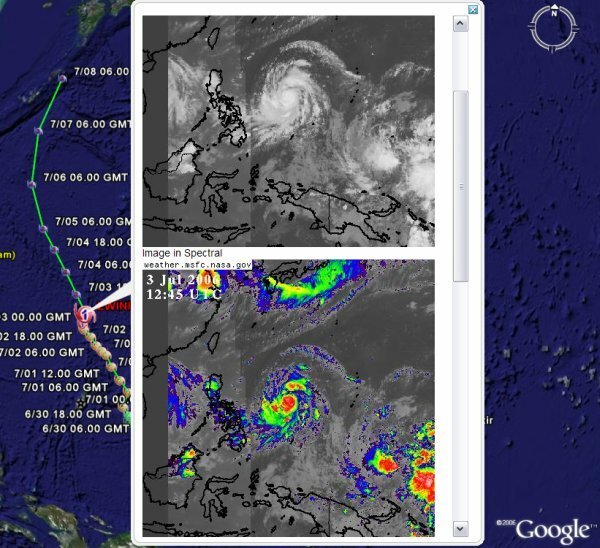 'Gerardo64' has posted instructions on how to make your own GeoRSS newsfeed for Google Earth . 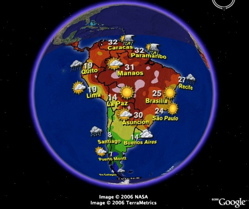 This uses a service from GeoNames.org which georeferences an RSS feed by examining the content for key locations (e.g. if "Chicago" is mentioned most it would tie the story to the coordinates for Chicago) . Here is an example of an RSS feed for top stories on Tour de France from Google News. This is similar to the network link by Daden Consulting called NewsGlobe written about at GEB last fall. via OgleEarth. 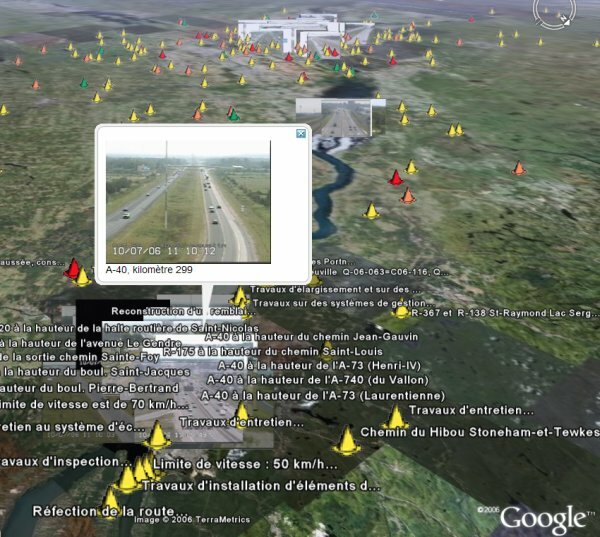 New improvements to the "Transportation Layer" in Google Earth have been quietly introduced. If you open the Transportation Layer folder you will see there are several levels of information for both Airports and Rail. I had already noticed that the airports layer now have better accuracy for the "Airport Maps (USA)" which show outlines to US airports, and the color changed from white to yellow-green. Today I noticed that the Rails layer now show different colored tracks for some cities, and include train stations in some places as well. All of these layers are vector lines drawn over the satellite/aerial photos in GE. Apparently the colored tracks are for subways or local trains, and so far I have just seen them for major metropolitan areas in US cities. Please let me know by adding a comment if you find other locations. Try San Francisco, Los Angelos, Boston, Washington DC, and Chicago for examples. I suggest you turn on the Transportation layer and go exploring! In Paris 25-28 July? 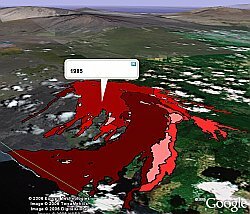 Make 100 Euros from Google Earth! Google is conducting a usability study in Paris, France 25-28 July. The sessions will be two hours long and you will be compensated 100 Euros if you are selected to participate. They are looking for people who have a fair amount of experience with the application. Here are the details on the dates and times. a questionaire, and an e-mail to send it to. See, you can make money if you use even the free version of Google Earth! Google Earth published its Sightseer newsletter last night. It's been a while since their last issue (December), which they acknowledge. But, they say they have been busy - which is quite true. They list a fair amount of the big announcements during the last 6 months and have several other stories of interest. There's a "Where in the World" contest (a photo from somewhere on the Earth) which, if you guess right, you can win a free copy of Google Earth Plus. There are several interesting KMLs to look at, and they even link to GEB! Here is a link to the posted version of the newsletter at the Google Earth Community. If you want to get the newsletter E-mailed to you in the future, the next time you download Google Earth, sign up for the Sightseer. Here's a link to the Sightseer forum where you can read some of the previous issues. Aquí hay algunas hermosas imágenes superpuestas sobre América del Sur y Central que fueron compiladas por alguien de la Comunidad Google Earth llamado "Gerardo64". Incluyen lo siguiente: foto satelital, temperaturas máximas y mínimas, radiación ultravioleta y temperatura del mar. Se actualizan automáticamente todos los días. Asi que revisen los pronósticos del tiempo de América del Sur y Central. Gerardo64 ha también creado un número de lindos modelos 3D sobre los que he escrito aquí en el GEB como por ejemplo el edificio Atomium, la Unisphere, y el Elevador Espacial. Can Google Earth be used in an educational setting? 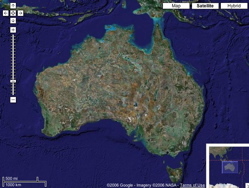 The use of Google Earth for educational purposes in primary, secondary, and post-secondary institutions is OK. In fact, Google has been known to give away Google Earth licenses to educational institutions, and included both Google Earth and SketchUp software for free in a large educational program for the state of Maine a month ago. A new cleaner image of the Earth's surface for high level zooms. You don't see the patchwork of different colored satellite and aerial images when viewed as if from space. Once you zoom in to look from airplane height or closer, you will then see the higher resolution satellite/aerial photos. Improved zoom features you can double click the left mouse button to zoom in, or double click the right mouse button to zoom out. According to reports I read, under Windows with Firefox or IE, you can use the mousewheel to zoom in and out. However, I just tried it with Firefox on my MacBook (OSX 10.4.7) and it worked for me. These are some nice features which have been wanted for a long time by many users of Google Maps. It will be interesting to see if Google releases the new better looking Earth views for higher height zooms in Google Earth. Personally, I am hoping they will use the new NASA Blue Marble Next Generation photos (a different set of photos for each month of the year). The word "google" is now official - at least according to the Merriam-Webster Online Dictionary. You can also hear how it is supposed to be pronounced. OgleEarth Links Page - has been updated. I haven't been keeping my links page up to date, but I am working on it slowly. In the meantime, check out OlgeEarth's. RoboGEO 4.2 - This program just keeps getting better. If you are looking to georeference your digital photos using your GPS automagically, there is really no better program. Check out the release notes on this latest version. Language selection can now be done from the Options/Preferences under the "General" tab. Choices are English, Spanish, French, Italian, and German. You can see the full list if you select the "Release Notes" option under the "Help" menu after you install the new version. There are several other critical fixes and a few other features added. The release notes on the web site haven't been updated yet. For those who didn't know, there are also GE 4 Plus and Pro (beta) versions for the Mac now (but, not Linux yet). Thanks for the tip Mike! Updated Plane ID Chart - Cyclonic, who maintains the planes in flight database, has updated the plane ID chart. 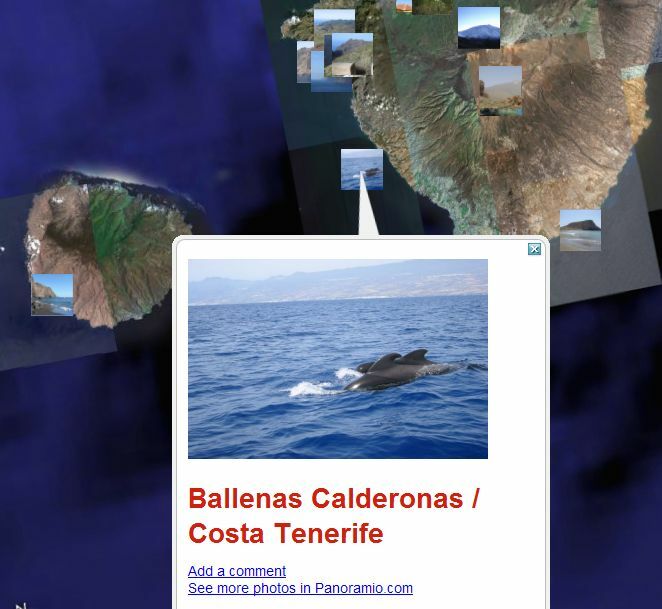 Panoramio - This really nice web site for georeferencing and sharing photos has added a cool new feature. You can "suggest new location" when you see photos which have been placed incorrectly. They also support photos which are already geotagged in the EXIF data (for example, the new Picasa beta lets you Geotag with Google Earth and stores the info in EXIF data inside the photo file). Photos already geotagged this way are automatically put on the map in Panoramio. Dell launches IT service using Google Earth Pro - I've been waiting for a screenshot, but it hasn't been forthcoming. Dell announced last week it will offer a way to track service calls for large enterprise accounts using GE to visualize locations. Plane underwater - Just thought this satellite photo showing a plane underwater (possibly a drug smuggler) was cool. Posted here. 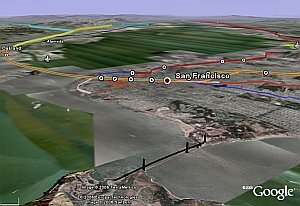 Proposed High Speed Rails - These new rails in northern California have been proposed by Architecture 21 according to this trainblog. 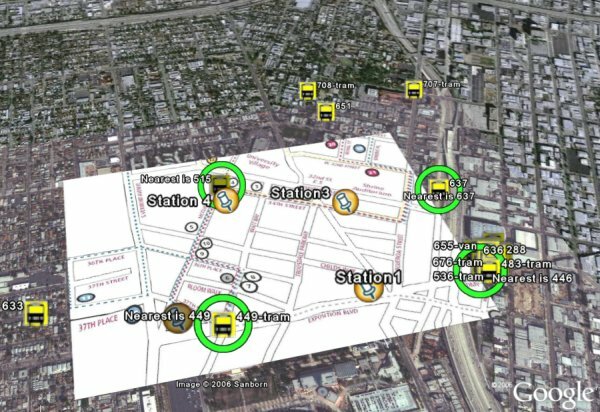 Sharing observational data using Google Earth - Jeremy Cothran, of University of South Carolina, has posted a kind of white paper to encourage observation systems (sensor webs) to use KML. Here's a real example he did I wrote about in April. 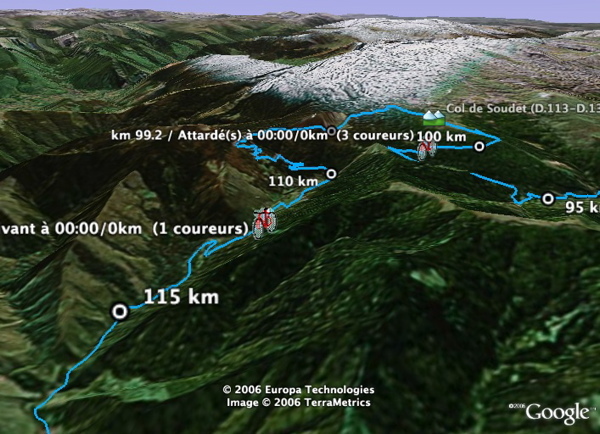 Google Helps Tour de France - Google is hosting and provided assistance to the official TdF 2006 web site to show routes of the 20 stages of the TdF. They borrowed work (with permission) from this effort, but for some reason haven't implemented the really cool live tracking capability yet. 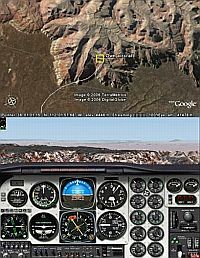 A nice collection of placemarks has been posted by someone called Dorseyland at the Google Earth Community. 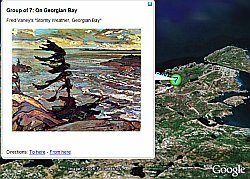 The collection provides interesting information, and pictures of paintings, illustrating the key places in the lives of Canada's most famous artists known as the Group of Seven. I recommend reading Dorseyland's post here for more background, but here's a brief synopsis of what he has created: In the early 1900's seven artists got together in their spare time to paint the Canadian north and subequently greatly influenced the art of Canada. 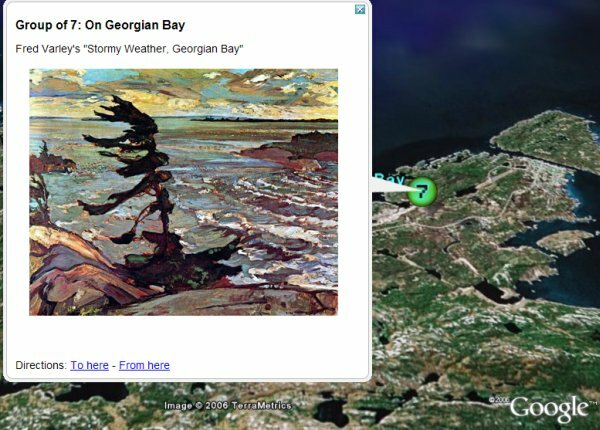 The Group of Seven Google Earth file contains locations in the lives of these artists and pictures of their paintings. The collection also documents the life of an artist named Tom Thomson who inspired the artists before and after he died under "mysterious circumstances". There's a link in the post to a collection of scans to paintings from the Group of 7 here. This is an excellent example of putting a story tied to locations in Google Earth and documenting with information, links, and photos. Good job Dorseyland! Thanks to Hill at the GEC for bringing this to my attention. Globe4D - a really cool video of a research project by Dutch multimedia students from Leiden University. 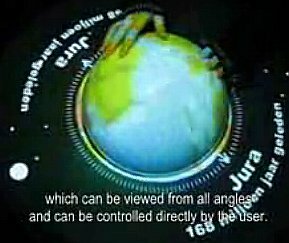 This is a physical device which lets you turn a globe which has a projected computer image. They not only show the Earth and other planets, but also project time so you can see the continents move on the Earth over time. Definitely a must for every space science museum! via Cartography. By the way, I really hope Google adds the 4th dimension to GE as well as support for flying to other worlds like Celestia. Wardriving with Google Earth - At PerryGeo (Matt Perry's blog) he describes the steps, and provides the code, to take your laptop with Ubuntu Linux and Google Earth and drive around finding WiFi hotspots to map their locations. Cool idea!